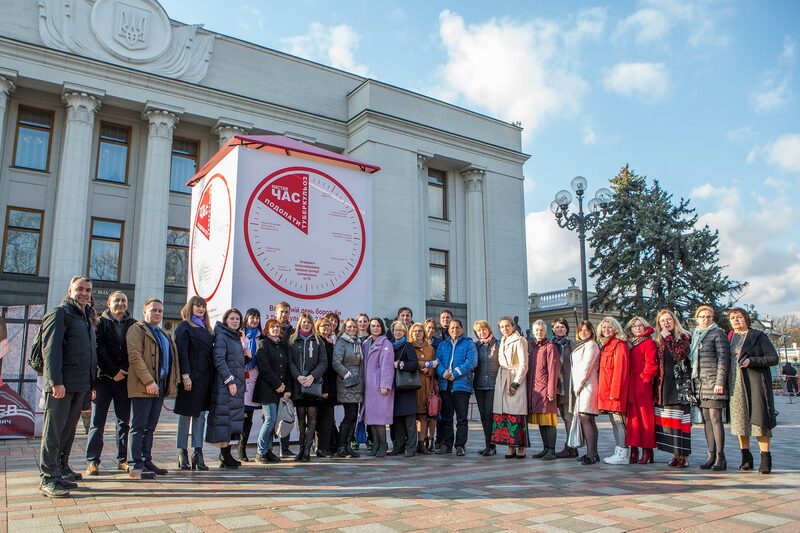 On March 21, 2019, on the eve of the World TB Day, public campaign “It’s time” was organized in front of the Ukrainian Parliament building with support of Alliance for Public Health. 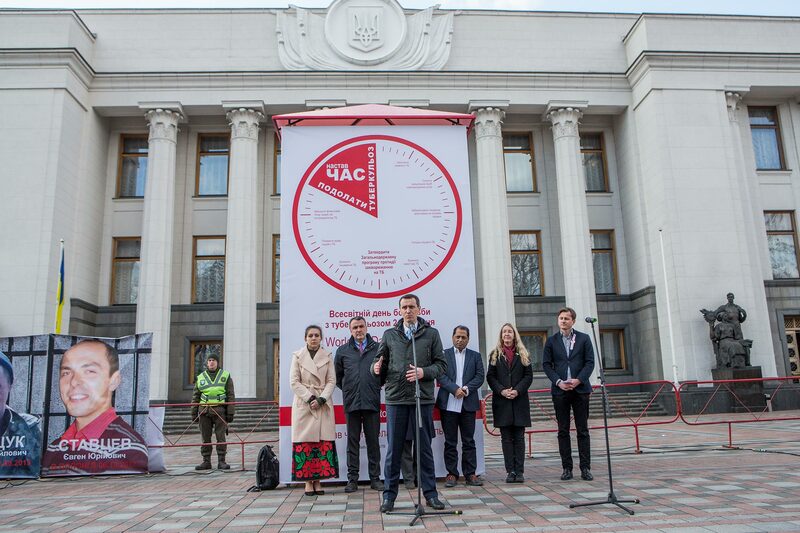 Within the campaign, a four-meter installation of a clock was set up at the Constitution Square near the Parliament, with the key messages of TB response in Ukraine put on the clock dial instead of the numbers, together with the slogan “It’s TIME to end TB.” This event was held within international awareness-raising campaign “It’s time” initiated this year by the Stop TB Partnership to draw the attention of general public and government officials to the problem of TB. 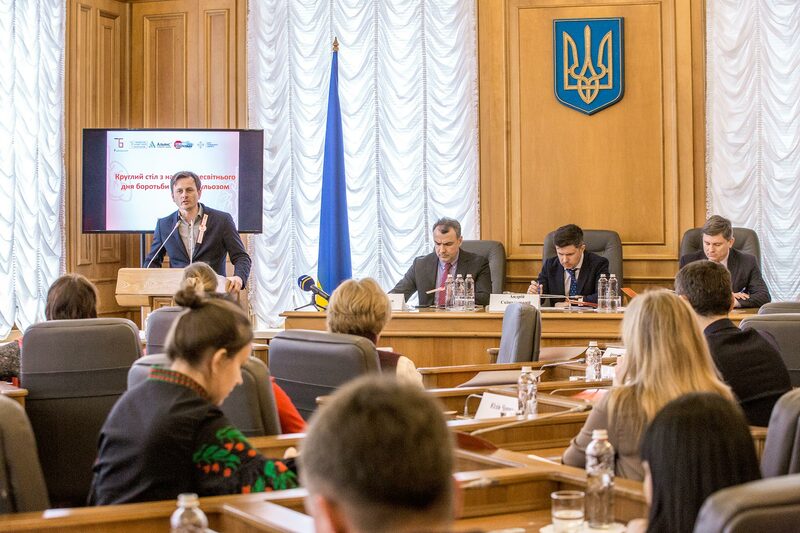 At the press briefing, campaign organizers said that every year approximately 3,700 people die of TB in Ukraine, which is about 10 people every day. This situation leads to the annual indirect losses of more than $12 million. Although in the recent years there has been certain improvement of the situation, Ukraine remains one of the countries with the highest burden of multi-drug resistant tuberculosis – the most severe form of TB, which incurs longer-term, more expensive and less effective treatment. Besides, according to the WHO about 23% of TB cases in Ukraine are missed. To improve the situation, the Cabinet of Ministers developed a middle-term strategic document – National TB Program – which is currently reviewed by the Parliamentary committees. 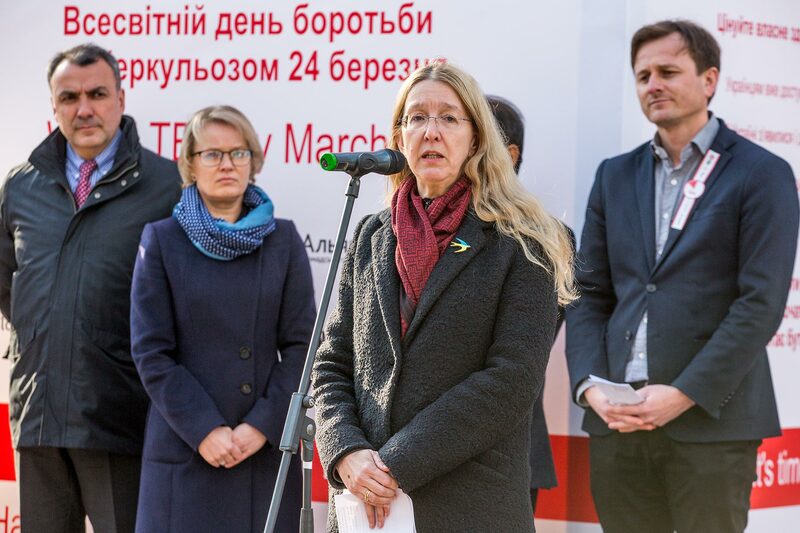 “The National TB Program that we are discussing today is not only the document setting the direction and creating the grounds of TB response in the country, but should also be part of the accountability system to monitor compliance with the commitments, which Ukraine undertook at the UN General Assembly High-Level Meeting on TB in September 2018. It’s time to start implementing those commitments on detecting, treating TB and overcoming stigma against people with this disease. I think that to achieve this goal it is crucial to establish cooperation of the responsible governmental authorities with the civil society and with MPs. Our joint efforts can become the driving force, which will allow the country to turn the tide in TB epidemic,” pointed out Serhii Kiral, MP, Chair of the Parliament Platform to Fight TB. 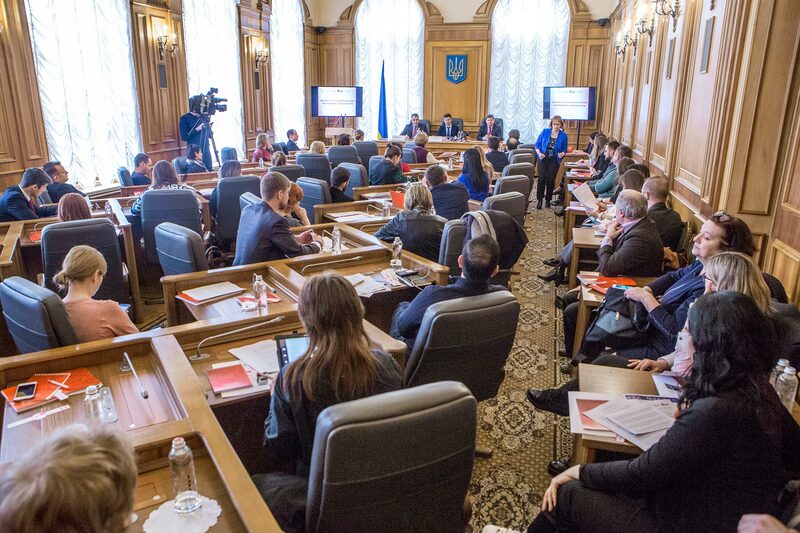 During the national round table in the Parliament, which was held before the press briefing, MPs, heads of the government bodies, international experts, and representatives of civil society and patient organizations discussed the situation with tuberculosis in Ukraine and pointed out that for the third year the country has been functioning without a valid National TB Program approved by the Parliament, which has an extremely negative impact on the efficiency of TB response. For our country, resolving this problem is a matter of national security, which requires comprehensive and interdepartmental approach at all levels. “Ending TB by 2030 is a joint intention of the humankind. Currently, Ukraine demonstrates a persistent trend towards reduction of the incidence of new and repeated TB cases. Last year, this number was 800 less than in 2017. Today Ukraine fully funds the procurement of TB drugs, and by procuring those drugs through international organizations, we were able to increase the quantity of the drugs purchased almost 40-fold. For instance, last year Linezolid was procured by international organizations for $0.27, while in 2014 the Ministry of Health procured it for $2.85,” told Dr Ulana Suprun, Acting Minister of Health of Ukraine. “With support of the Global Fund and other donors, Ukraine made a big progress in fighting tuberculosis. In the context of transition from donor to domestic funding of TB response, it is crucial not to lose our achievements. Draft law No. 9467 stipulates implementation of a patient-centered approach to TB care, compliance with the rights of patients and their family members, involvement of communities to end the epidemic of TB in line with international strategies and recommendations,” outlined Zahedul Islam, Director: Treatment, Procurement and Supply at Alliance for Public Health, which is the focal point of civil society organizations in Ukraine in working with the international movement of parliamentarians, the Global TB Caucus, and provides technical support to the Parliament Platform to Fight TB. Many developed countries have already given up the practice of long-term hospital stay due to the high risk of cross infection and due to the problems, which patients face if they have to leave their social environment for a long time. Patient-centered approaches currently introduced in Ukraine stipulate, in particular, transition to outpatient treatment if there are no special reservations. “The biggest danger for people around is a patient with undiagnosed TB, while the best TB prevention in this case is detecting the disease as soon as possible and prescribing TB treatment,” emphasized Victor Liashko, First Deputy Director of the Public Health Center of the Ministry of Health of Ukraine.